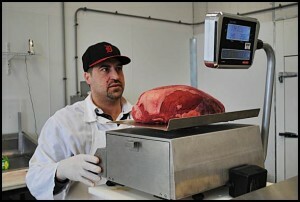 Berry & Sons Meat Market is a carnivore's paradise. At this butcher shop on Caniff you can get whatever cut of meat you want -- or the whole animal. Just in time for grilling season — if it ever warms up this year — Hamtramck has a new shop that can “meat” all of your needs. Berry & Sons Meat Market, located in the shopping strip at the intersection of Caniff and Gallagher, recently joined the ranks of Hamtramck’s numerous businesses. If it had a beating heart, chances are you can find a part at Berry & Sons. The butcher shop is the fourth retail location of Berry & Sons, which was started 36 years ago by Salah Berry and now includes a slaughterhouse in Eastern Market. Continuing a 100-year-old family tradition that stretches back to the family’s origins in Syria, the Hamtramck site is owned and operated by Salah’s son, Mohamad. For anyone who likes meat, all you’ll need to know is how to get to Berry & Sons at 3218 Caniff. Inside you’ll find whatever piece of cow, chicken or lamb you desire — just no pork. The business prides itself on being 100 percent Halal. Another point of pride for the business is how clean it is. And if cleanliness is next to godliness, then Berry & Sons is basically a holy site. Because Mohamad Berry is big on preventing cross-contamination, there are different coolers for each meat, as well as for cooked, uncooked and marinated products. The numerous coolers are just a small part of an overall larger overhaul done to the retail space. Formerly a T-shirt shop, the building was completely gutted from floor to ceiling and retro-fitted with everything needed to make it a functioning meat market, including floor drains and a 12’x12′ walk-in cooler. In the coming weeks there are plans to build a new register counter, add some neon signs to the windows and start selling bread. And being an avid hunter, Mohamad Berry also has plans to display some of his deer mounts. Berry & Sons Meat Market is located at 3218 Caniff and is open Monday through Saturday from 9 a.m. to 6 p.m., and Sunday from 9 a.m. to 3 p.m. There is a parking lot in the rear of the building and a ton of great deals to be had on everything from ground beef or chicken legs to whole goats or lambs and veal shoulders. For more information or pricing call (313)-870-9667.